Throughout the month of September, there has been one question everyone was asking here in Oaxaca. From friends and family to total strangers, at school or church or in the market: ¿cómo pasaste el terremoto? How did you experience the earthquake? This question, of course, is referring to the 8.2 quake on the night of September 7th centered in the Pacific Ocean just south of here. For the most part, here in the city of Oaxaca, the answers have consistently been along the lines of “Un sustote.” “It was a big scare.” There was some minor damage — and a few isolated cases of major damage — but mostly it was a scare. As for our family, the kids were all sleeping and Erika and I were just getting into bed when we first felt some shaking. We have lived through a fair number of earthquakes these past six years in Oaxaca, so first we waited a few more seconds expecting it to pass. But when the seismic alarm in the neighborhood began to sound, and as the shaking only grew stronger and began to shake everything in the house, we realized this was not an ordinary tremor. We went and got the kids out of bed to move to safety. The floor shaking beneath our feet was disorienting and the sounds of rumbling and crashes of glass were frightening. A minute later – which feels like an eternity in earthquake time – the shaking finally subsided. We were all fine. Maya finally started crying after it was all over, unhappy about being yanked from her crib for no apparent reason. The power was out, so I went through the house with a flashlight to check for any damage. There were a few toppled objects and I cleaned up some broken glass from framed pictures that had fallen. Nothing major. Upon returning to bed, I found it full of kiddos a little nervous about being alone in their beds. I could hear neighbors in the street commenting that the epicenter had been close to the Isthmus region of Oaxaca. One by one we we began to fall back to sleep and at some point in the night, the boys returned to their own beds. That was our experience. And it was similar to that of thousands of others living in the capital city of Oaxaca. Un sustote. But, of course, this massive earthquake did have devastating effects in other parts of the state of Oaxaca and the neighboring state of Chiapas. The region known as the Isthmus, in particular, was terribly damaged that day. Many building were leveled and many more were irreparably damaged. Tragically, dozens of lives were lost in Oaxaca and Chiapas that day. There are three Covenant churches in the Isthmus region — Tehuantepec, Ixtepec and Lachivizá. Thankfully, these areas were not in the worst of the effected areas. Some of the church members had some damage to their homes, but the main impact for most of them has been the emotional trauma. Even in the midst of living through their own trauma, members of these churches have reached out and are serving neighboring communities that were harder hit (more on that below). Twelve days later, in the middle of the afternoon, the earth shook again. This time the epicenter was near Mexico City. 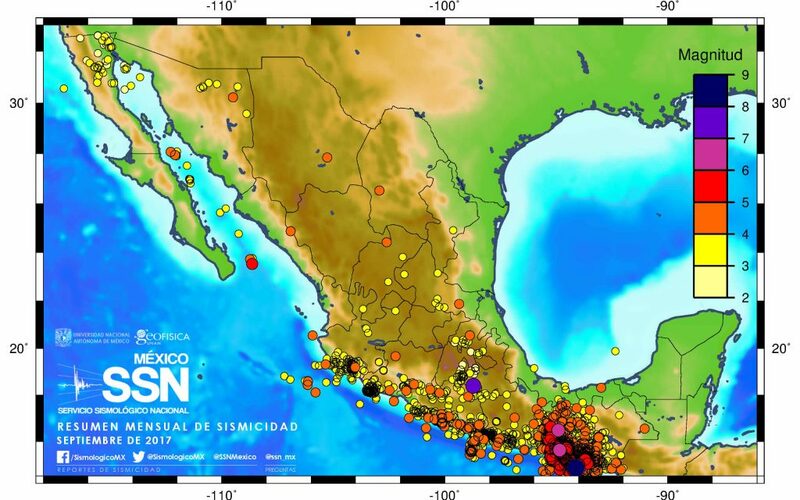 While not as large as per the Richter scale (7.1), this earthquake did even more damage as it affected parts of Mexico City and the states of Puebla and Morelos where the population density is far greater. (Again, our experience here in the city of Oaxaca was similar to the first – a good scare but minimal damage.) Ironically, it happened on September 19th, the exact anniversary of the 1985 earthquake in Mexico City where thousands lost their lives. Map of the earthquakes and aftershocks during just the month of September. Following the September 7th earthquake in the Isthmus, there have been almost ceaseless aftershocks. As of October 24th, there had been 8678. You read that correctly, that’s an average of 184 aftershocks per day! Every 9 minutes, the earth is rumbling again and sometimes those rumbles have been as large as 6.1 on the Richter scale. Of course, the majority of the aftershocks are smaller and have not caused additional physical damage. They have, however, added significant emotional stress. Even for those whose homes were not destroyed, the incessant aftershocks felt in the Isthmus makes it is hard to sleep at night as they wondering if the next one will be the one to knock down their house. Many families are sleeping outside for just that kind of fear. 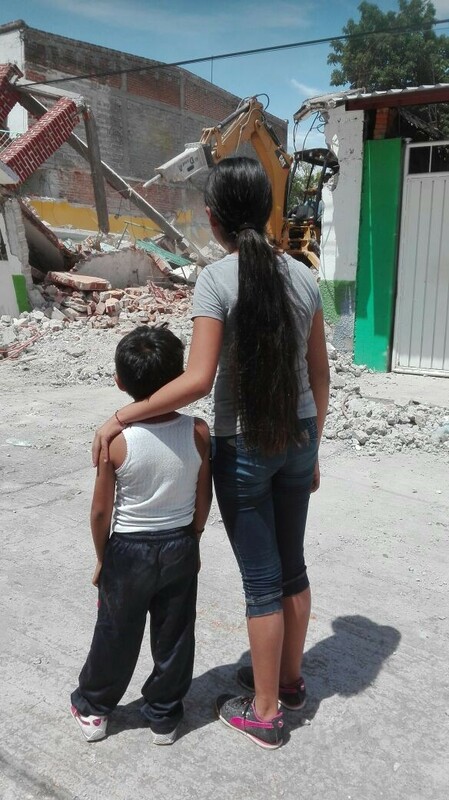 The church plant in Mexico City, called Misión DF, has partnered with El Pozo de Vida (Well of Life) and other organizations to assist families in Tlaquiltenango, Morelos demolish their irreparable homes that posed a danger of further collapse. Additionally, the project has included a first-aid campaign as well as psycho-emotional support. Approximately 100 volunteers have been trained to identify individuals who may be suffering from emotional trauma and to offer pastoral care and emotional support. 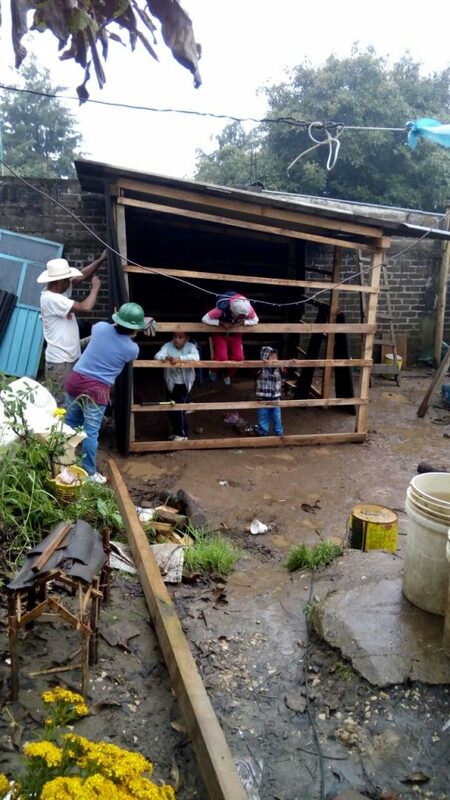 The Cuautla (Morelos) Covenant Church, and El Dorado Covenant Church (Mexico City) have partnered in the construction of temporary but dignified shelters for families in Tetela, Morelos. To date, eight families have a temporary shelter to live in during the reconstruction of their home. The wood and laminate sheets used for the shelters will be re-used in the later construction of the permanent structure as well. 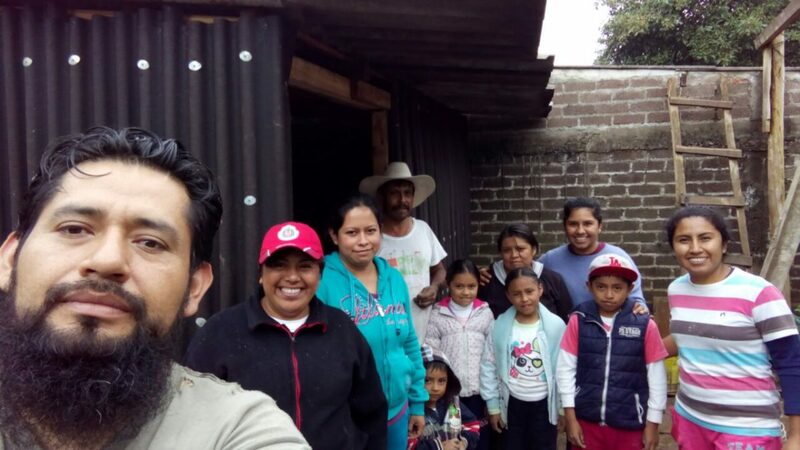 The ministry of MAEM (Ministry to the Abused and Exploited in Mexico) in Oaxaca is adapting what they have learned about accompanying people through times of crisis of abuse to apply to those living through the crisis of natural disaster. They have spent time with the Covenant congregations in Ciudad Ixtepec and Tehuantpec as well as the town of San Mateo del Mar (see below). Fuentes Libres, the Covenant micro-enterprise community bank ministry has had 2 women’s groups in the town of San Mateo del Mar for the last five years — a town right on the coast in the Isthmus that was drastically effected by the quake. This connection to the community has allowed for Fuentes Libres, together with several other organizations and churches, to provide food and water to the community in a dignified and orderly way. They are now looking at how to walk alongside the community through the stages of recovery, including working with MAEM to provide emotional support. The Oaxtepec Covenant Church is constructing houses in Jojutla, Morelos and has already completed one and begun work on the second. An architect from the church has helped create a design for the houses that is affordable but also created to be earthquake resistant. The pastor, together with construction workers from the church, have been traveling one hour each way, six days a week to donate their labor to the construction. The first house was completed in just 2 weeks. And the Covenant Churches in the Isthmus are responding to their neighbors most in need with food and other supplies. Additionally, the Ixtepec church has opened a space for a kids program in the mornings to serve the children in their neighborhood whose schools were damaged and remain closed. The beauty of each of these examples of emergency responses was that they were immediate and organic as each church and/or ministry responded to the needs of their neighbors, giving of their own resources and time. Along the way, Covenant World Relief has helped to fund several of these projects allowing them to have a broader impact, and CWR is willing to accompany the ongoing recovery efforts. You can use the following link to give to CWR’s Disaster Response Fund with the note that is it for “Mexico Earthquake Relief”. We thank you for your prayers for the people of Mexico and for our family. Our kids will still occasionally express concern as they go to bed at night. Please pray for peace in their (and our) hearts and minds. Glad to hear that you all are okay! I’ll be praying for the clean-up and repairs in the area, and I’ll be continuing to pray for your ministry as well.